Main character of the story- Ranjoy, he is a simple village young man. Unfortunately, the naughty people of the another planet transformed him into blue color. He became a blue-colored man. His physical strength also became strong. Sunil babu wrote one after the other stories by making the main character to Ranjoy or Nil Manush. 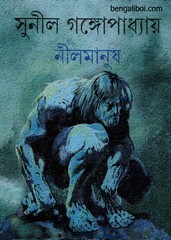 Collect this teenage literature and science fiction- Nil Manush ebook as a pdf file. The pdf has 218 HQ pages with 25mb file size.